As you stroll through this small country cemetery you will notice the beautiful metal art works that are the iron cross grave markers for many of the early Munjor pioneers. The southeast section of the cemetery has the most iron crosses (44) and is also the location for two of the town's founders - Peter Stoecklein and Peter Leiker. Iron crosses serving as grave markers are something you typically will find only in cemeteries of Germans from Russia communities. Local blacksmiths and men from the community who were good at working with metal hand crafted these iron crosses. 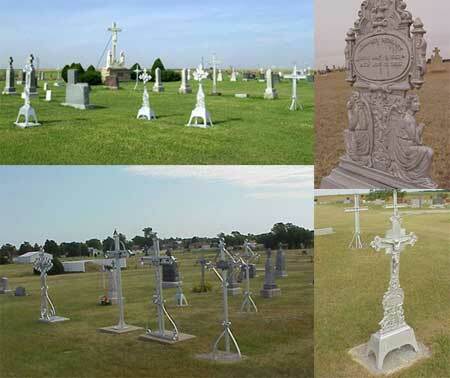 Other towns in Kansas, South Dakota and Nebraska that trace their roots to Germans from Russia have iron cross grave markers, but the St. Francis Cemetery is unique because there are 12 priests buried at this small parish cemetery. To the west of the crucifix you will see stone markers for the priests and Capuchin Friars that date from 1908 (Fr. Maurus Schebler) to June 5, 1990 (Fr. Leo Leiker O.F.M. Cap). The first adult death was Agnes Fischer, who died soon after the settlers arrived in 1876. She was crushed to death from a cave-in of sod blocks when they were building their sod home.